An ideal base for a family/friend gatherings or attending GOODWOOD events. A spacious 5 bedroom detached house, set in an acre of gardens, on the edge of the South Downs . Walking distance to Goodwood House & Hotel and all Goodwood Motor events & close to Goodwood Horse Racing 15 minute drive to The Wittering beaches and harbour walks. London 60 miles away. Comfortably sleeps 9 adults (inc 4 couples) or up to 12 with children. Home from home with everything you would expect to make your stay enjoyable. SMART TV, WiFi,games, DVDs and a large garden for children to a comfortable adult lounge for relaxing in the evening with a log fire for winter nights. Located in a quiet hamlet of about 20 houses on a quiet country lane between Boxgrove and East Lavant. 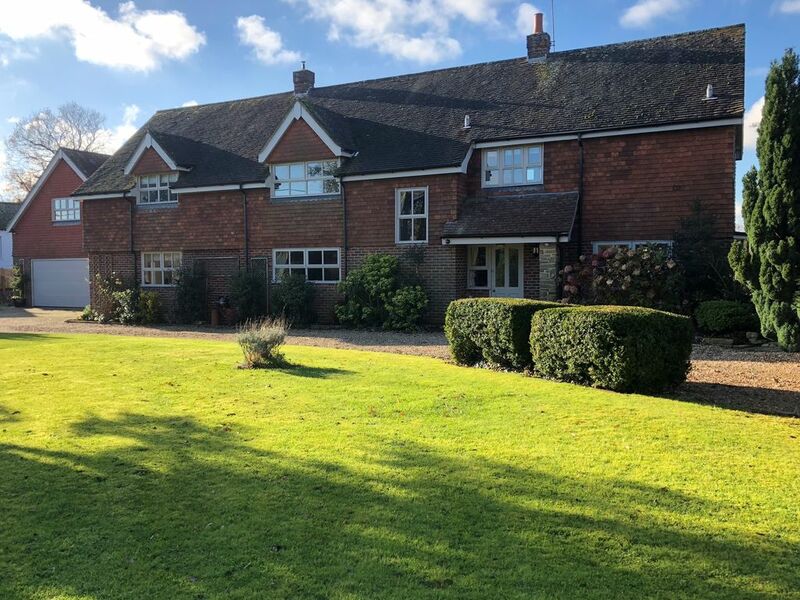 Set in just under an acre, with wonderful views over Goodwood, this property is ideal for a family holiday and guests can have use of Goodwood Country Club leisure and golf facilities at a very low cost. Oak Lodge is set back from the house with its own drive and parking. With a king size bedroom this would accommodate another 2/3 persons in their own private space. I have been managing self catering holiday homes since 2007 having run my own Market research business for several years. Oak House is available most of the year for short breaks or longer lets. Oak House is the perfect location for a holiday or family reunion - close to Countryside and 15 minutes away from the beach. The house is very spacious with 2 dining areas and 3 rooms for relaxing or watching TV. The garden is large and in the summer guests can watch the sun set from the large first floor balcony or the large seating area on the patio - equipped with BBQ and fire pit. 1 washing machine with large boiler room for drying. Large Triple access lounge with open fire, grand piano. 2 large sofas and extra seating. Extensively kitted for all your needs. White china crockery. Very large living kitchen with separate dining area (seating 10) and tv area with corner leather sofa. A cupboard full of board games - adults and children! My family and I, 10 in total, 7 adults and 3 children had the most amazing time in this absolutely beautiful house.The host was truly fantastic. A great communicator before, during and after our stay. The house was definitely home from home. The moment we entered through the front door you were made to feel very welcome. Everything was there that we needed for our perfect holiday retreat. The weather was very kind to us so we could benefit from the beautiful gardens with its huge garden table and chairs plus benches and a great BBQ. Plenty of ball games including badminton for the children to keep them amused. Highly recommended! A lovely property with very friendly hosts, great rooms all facilities excellent including free Internet. Most amazing location literally a 10 minute walk to Goodwin House for FoS and 15 minutes walk to Airfield for Revival. Free parking, good breakfast very laid back no fuss nothing too much trouble. Highly recommend this accommodation for a great Goodwood Experience. Spacious house with plentiful off road parking and all modern facilities. Perfectly located for access to Goodwood Motor Circuit at Festival of Speed or Revival weekends. This means it is also perfectly located for Goodwood Races and of course the beautiful coast south of Chichester. The property owners are very welcoming, helpful and flexible. Our stays, as we have used the property several times, have always been excellent. Eine tolle Lage für alle Events in Goodwood. Gute Ausstattung des Hauses mit einem schönen Garten. Well located for going to beautiful nearby beaches, attending events in the local area or day trip to London, Brighton and Portsmouth.